The DeLonghi EOP 2046 Toaster Oven is a handy product to have around the kitchen. With its in-built Panini press, sufficient capacity and overall good performance, this DeLonghi toaster oven can be a good assistant to use when toasting, baking, or making Panini. Yes, you don’t need to step out for your favorite Panini anymore and you can easily make it with grill marks and perfect browning at home. This model comes with bake pan and recipe book so you just need to follow the steps to make delicious Panini. With this toaster oven, you can choose functions from bake, broil, toast, slow bake, panini and keep warm. You can bake a 12-inch pizza, broil a whole fish or toast 6 slices of bread in its spacious interior space. One thing that you should know before placing your payment order is that this toaster oven doesn’t have convection function or oven timer. Sufficient Space – This oven has enough cooking capacity to cater to the requirements of most households. It is, in fact, big enough to bake an entire twelve inch pizza, and is therefore capable of handling foods of similar size. Panini Press – This feature of the DeLonghi EOP2046 Toaster Oven is what makes it stand out in the toaster oven market. It comes with an integrated Panini press, which can be pressed on the food for grill marks and cooking. You can also use this feature to make other similar sandwiches like tortillas. Grill Plate (Nonstick) – The nonstick grill plate that comes with this oven makes it possible to grill food on it without worrying about uneven grilling or food getting stuck on the plate and losing its shape and flavor. All sorts of food including fish and vegetables can be easily grilled in this toaster oven. 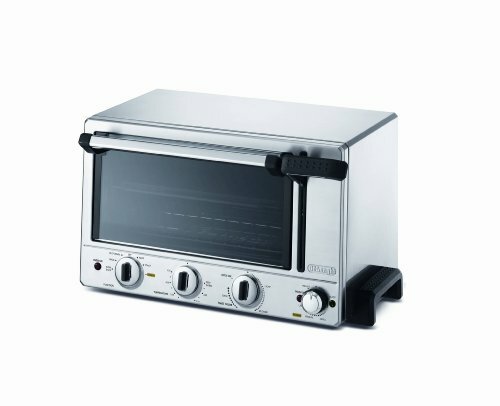 Panini Timer – A special timer designed especially for Panini preparation is integrated in this oven’s design. You can control the settings of this timer via a control knob, which has features such as preheat, cook, small and medium. Toast Timer – You can set the toast timer according to the kind of toast you want; this oven comes with light, medium and dark toast color settings. In addition to these special features, other conventional oven features are included. It has a temperature knob which ranges from 200 to 450 degrees Fahrenheit. This oven also has a crumb tray which drops down so that it can be cleaned. This is a handy feature which makes it easy to keep the oven clean and well maintained. What Do Owners Say About The DeLonghi EOP2046? Panini Function – One of the biggest advantages of this product that buyers love is its Panini feature. Not only does this feature provide grill marks on sandwiches, but also cooks them nicely and evenly. Overall, most buyers think the toasting quality is impressive. Heat Control – Compared to other toaster ovens that generate much extra heat to the room, it generates much less heat and is safe to fit most space. Easy Cleanup – Another reason that buyers love this product is that the maintenance and cleaning procedures are very simple for its nonstick grill plate and drop-down crumb tray. Time Control – Although it has many wonderful features, some owners complained about this oven because it does not come with an auto shut off feature or a countdown oven timer but those “light, medium, dark” timers. The user has to keep track of these things in order to avoid damage to the food. Slow Heating – Another small issue buyers found is that for the first few weeks, its heating element proves to be a bit slow. However, after this time period the heating element starts working at full capacity. It is worthy of note that it doesn’t have automatic slide out shelf with the door so for some user it may cause some inconvenience. With its traditional oven features, integrated Panini maker, and large size, this oven is a good assistant for modern domestic kitchens. It is an overall good product that worth your money but also has some flaws for users.